A chef is a configuration management tool for managing machine setup on physical servers, virtual machines and in the cloud, for example, Amazon EC2, Google Cloud Platform, OpenStack, SoftLayer, Microsoft Azure. A chef is open source tool that streamlines the task of configuration and maintaining an organization’s servers. It is written in Ruby and Erlang languages, it can easily integrate with cloud platforms to automatically provision and configure new servers. A tool for automating and managing the configuration of infrastructure. Written in Ruby. Types of thing are managing by Chef, for example, Files, Users, Services, Packages, Mounts, and much more. Servers that are maintained by hand tend to become fragile environments that are hard to understand and modify. Easy to configure the server in a consistent manner. Make life easier for your system administrators by automating repeated tasks with a configuration management tool. Automation reduces opportunity for error. With the help of configuration management tool you can quickly restore services. When rebuilds are easy, system administrators gain confidence to make changes to infrastructure more rapidly. Infrastructure configuration is kept in the source configuration management tool. You can easily manage thousands of servers using only a handful of employees. Chef is written in Ruby language, so you can customize Chef. You are not locked into one way of using Chef. 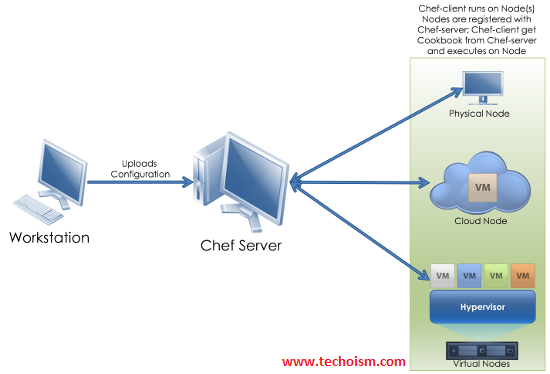 A chef can operate in a distributed stand-alone mode or in a centralized mode requiring a server. Chef is open source and supported by a vibrant community of system administrators and developers.